Bihar Police Constable Final Result With Unit Name 2018 Check Here. Bihar Police Constable Syllabus 2018. Bihar Police Constable And Fireman Cancelled Notice. Bihar Police Constable 2018 Admit Card Check Here. Bihar Police Notification is out. Bihar Police is recruiting for 11865 Constable and Fireman 2018 Final Posts. 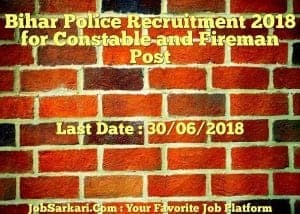 You can check Bihar Police - Bihar Police last date, download Bihar Police notification, visit Bihar Police official website and check other Bihar Police Vacancy details.Complete Vacancy and recruitment Details about 11865 Constable and Fireman 2018 Final vacancies in Bihar Police are provided below by JobSarkari.Com only for you. Last Date for Apply Online 30/06/2018. Mode of Payment Application Fees Can be Submitted though Online Mode Using Debit Card, Credit Card or Net Banking. Maximum Age for UR(Male / female) 25 Years. Maximum Age for BC / OBC (Male) 27 Years. Maximum Age for BC / OBC (female) 28 Years. Maximum Age for SC / ST (Male / female) 30 Years. UR (Male) 165 cms. 81 cms after Expansion 86 cms. OBC (Male) 162 cms. 81 cms after Expansion 86 cms. SC / ST (Male) 160 cms. 79 cms after Expansion 84 cms. Gorkhas 160 cms. 79 cms after Expansion 84 cms. female of All Category 155 cms. N.A. 4..Fill All the Mandatory Details in the Application Form. 5.Upload the Scanned Copy of Photograph and Signature in Jpeg Format. 7.Online Application Can be Submitted on or Before 30th June 2018. Q. What is the Last Date For Bihar Police Constable and Fireman 2018 Final Vacancy ? A. Last Date for Bihar Police Constable and Fireman 2018 Final Posts is 30/06/2018. Q. 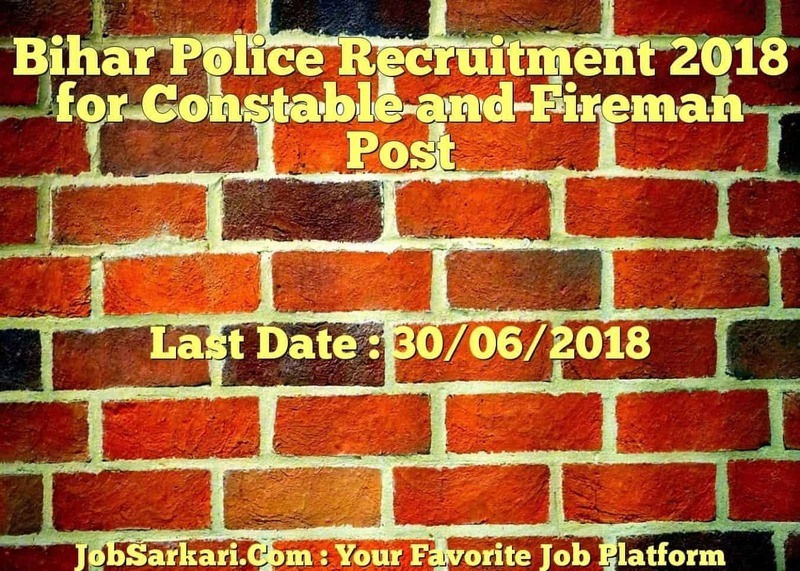 What is the Form Type of Bihar Police Constable and Fireman 2018 Final Recruitment ? A. The Form Type for Bihar Police Constable and Fireman 2018 Final Posts is Online. Q. How many vacancies are available in Bihar Police Constable and Fireman 2018 Final Posts ? A. There are about 11865 Vacancies in Bihar Police Constable and Fireman 2018 Final Posts.